This option will let you load drawings from one element at a time, for quick ink and paint on a single layer animation. 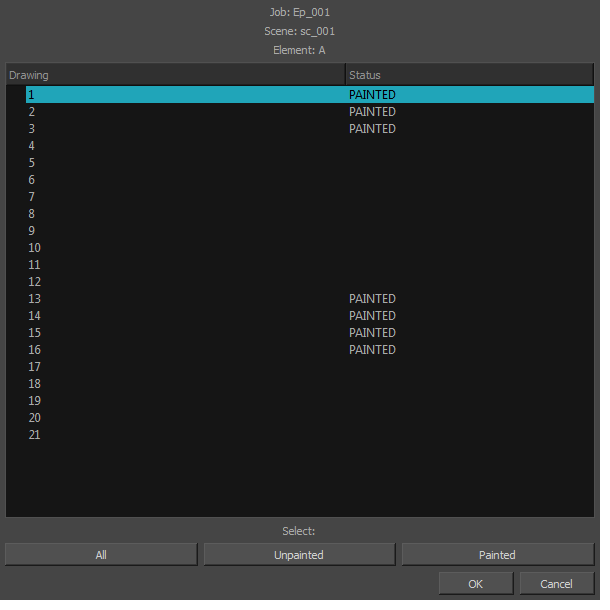 Once Paint is launched and you are logged in, select File > Open Drawings. Press Ctrl + O (Windows/Linux) or ⌘ + O (Mac OS X). The Database Selector opens, displaying the Environments available from the Harmony database. 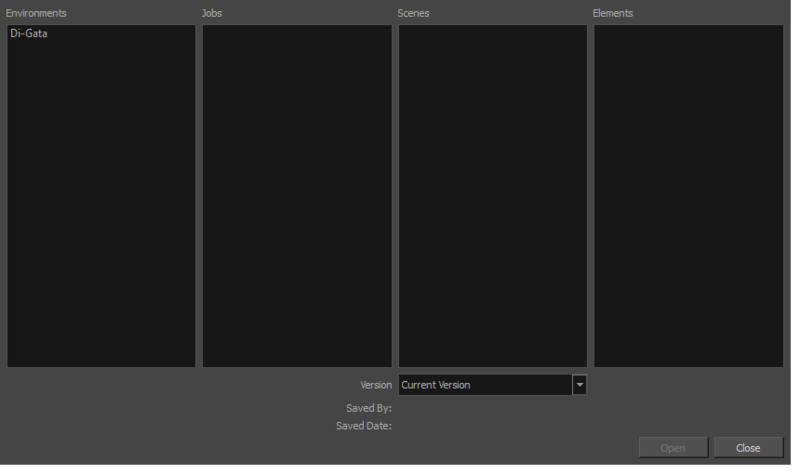 Select the Environment, Job, Scene and Element where the drawings you need to paint are located. Choose the version you want to open from the Version drop-down menu. The Saved By and Saved Date fields display the user who was the last to save the selected scene and the date of the last save. The Drawings Selector dialog box opens. Click on a single drawing to select it. You can create a continuous multiple selection by holding the Shift key. You can create a multiple selection by holding the Ctrl (Windows/Linux) or ⌘ (Mac OS X) key. Click on the All button to select all the drawings that are listed in the Drawings Selector. Click on the Unpainted button to select all the drawings whose status appears as UNPAINTED. Click on the Painted button to select all the drawings whose status appears as PAINTED. Use the Control panel to navigate between the previous and next drawings. Press F and G.
You are now ready to ink and paint!